Speak Milk. 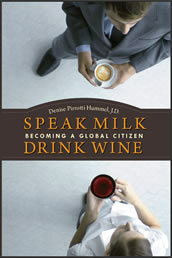 Drink Wine by Denise Pirrotti Hummel, J.D. Speak Milk. Drink Wine. recounts the life-changing experiences of the Hummel family who traded in their high-powered New York lives for a year of adventure in Italy, a chance for their children to transcend their culture, an opportunity for full-immersion language acquisition, and a once in a life time glimpse of their lives as Americans, from the outside in. On prior vacations they had experienced the warmth of the Italian people and an elusive quality that author, Denise Perrotti Hummel, J.D., describes as "the extra" something her life was lacking. She hoped that some of it might rub off on her family. At a minimum, she expected that jumping off the treadmill of the rat race she and her husband were on, might give them some perspective about what wasn't working in their demanding lives. What she didn't expect was the hilarity that resulted when their fast-paced American culture met head-on with living at ritmo lento Italiano, the authentic Italian slow life, or that the effect would endure much longer than the one-year they anticipated living in Italy. Nor did she expect that the lessons learned over a leisurely vino bianco would extend beyond the confines of the lush valleys of Lombardia, toll louder than the bells of the campanile in the local piazza, and last a lifetime. This book is for anyone who ever said they'd be happy "if only." 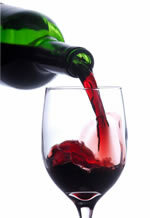 After you speak a little milk and drink a little wine, the term "if only" just might become an expression of the past. The courage exhibited by the author and her family in reaching for their dreams is laudable, but the lessons they learned so simple, that even the most timid will be inspired to action.